Only a few days ago, many people lost their lives in a stampede on the banks of the Ganga river. There is a structural solution that can save lives on crowded sloped paths. The mechanism is described in the image. It’s actually quite simple. 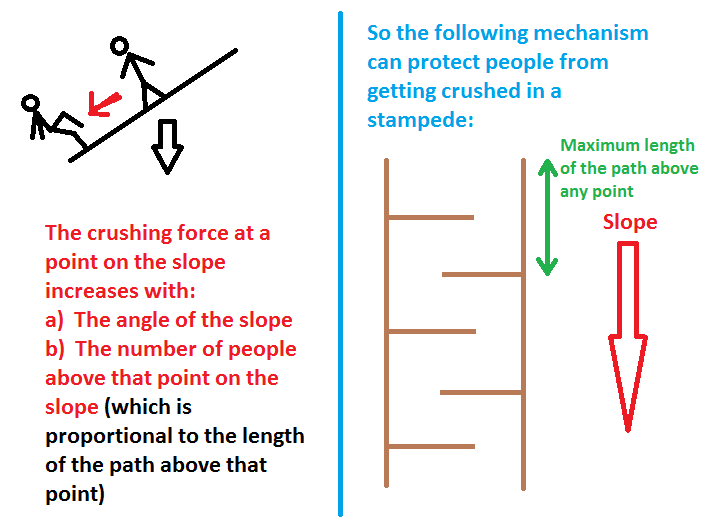 The force that can result from a crowd of people falling increases with the slope and with the number of people up above that point. The number of people above a point is proportional to the length of the path above the point. By cutting up the path with barriers like the ones I have shown in the picture, you can control that length and keep it from becoming excessive. When I described this solution to my colleague Saravanan (this was back when I was interning in Bangalore four years ago), he suggested a simpler solution (which doesn’t involve barriers). Anybody want to take a guess how a simpler solution might look and work?